MINIELECTRIC is a small Electrical Contractor involved in the Authorized Contractor Program (ACP # M-R1853) of the Electrical Safety Authority (ESA/ECRA Lic# 7006066) We are experienced in residential and commercial projects and we take pride in doing the job right! Whether it's new project, small repair work or custom remodels, we can handle any task with ease and to the highest standards to Canadian Electrical Code. We guarantee our work and your unconditional satisfaction because that is our ultimate goal. We are fully insured and WSIB covered. ALC ELECTRIC INC IS A FULLY INSURED,BONDED,AND LICENSED ELECTRICAL COMPANY,DESIGNED TO MEET BOTH RESIDENTIAL AND COMMERCIAL ELECTRICAL NEEDS.OUR COMPANY PROVIDES THE HIGHEST LEVEL OF CUSTOMER SERVICE,FOCUSING ON CREATING A SAFE AND FUNCTIONAL ENVIRONMENT. WITH OVER 25 YEARS OF EXPERIENCE, ALC ELECTRIC INC. IS SURE TO EXCEED YOUR EXPECTATION OF QUALITY AND HELP YOU REALIZE YOUR VISION.OUR STRAIGHT FORWARD APPROACH AND YEARS OF EXPERIENCE ENABLE US TO PROVIDE FAST AND EFFICIENT SERVICE, WHICH SAVES YOU MONEY. WE SERVICE A WIDE RANGE OF PROJECTS SUCH AS CUSTOM BUILT HOMES, RENOVATIONS, ELECTRICAL REPAIRS,AND COMPLETE RE-WIRING, POT LIGHT INSTALLATION, PANEL CHANGE,LED LIGHTS. Residential Service and Installation Electricians It is hard to find a good licensed residential electrician these days but you have just discovered the best! You want the electrician who shows up to be clean, courteous and trustworthy as well as skilled, knowledgeable and experienced. In other words, you want someone who looks like a professional and does the job in a professional manner. Nu-Tek Electric will come to your home to diagnose and repair any electrical problem you may be having, or offer professional assistance in designing renovations and additions. We will do all your electrical work to guarantee an excellent job for you and ensure your electrical safety. All the electrical materials we install for your project will be the finest that are available. Plus, we treat your home and property as if it were our own, leaving nothing behind but an outstanding electrical job and your complete satisfaction. The needs of every individual customer are important to us at Nu-Tek Electric. Our focus of providing quality residential and commercial electric services combined with customer service has made us the first choice of many local clients since 1989. You can count on us to take care of your electrical needs! Nu-Tek Electric values our repeat and referral business, and we are very thankful that our wonderful customers appreciate our timely and quality installations and who keep calling us back time and time again! We provide electrical services across Toronto, Brampton, Mississauga, Milton, North York, East York, Oakville, Richmond Hill, Aurora, Newmarket, Brantford, Markham, Vaughan, Pickering, Ajax, Oshawa, Scarborough, Whitby & surrounding Greater Toronto Areas.Our certified electricians ensure that our client's specific electrical needs are provided in a timely and cost-effective manner, matched with highly skilled certified electrician professionals. MASTER ELECTRICIAN AND ELECTRICAL CONTRACTORS IN OSHAWA, DURHAM REGION, TORONTO AND THE GTA. Green Planet Electric offers electrical contracting, fire alarm wiring installation, inspection or verification, ESA (approved) certificates, lighting automation for the home and industrial settings including hotels, and other applications such as home theater wiring . We also work with general contractors for all kinds of projects, such as basement and kitchen renovations, additions, and also numerous commercial and institutional type projects. When you need quality electrical work done, anywhere in the Durham Region, Toronto and the GTA turn to Green Planet Electric. As an established electrical contractor in the Greater Toronto Area , Green Planet Electric has skillful and certified electricians with the training and experience necessary to complete your installation or repair with the speed, professionalism and efficiency you expect. Whether your property’s electrical system is brand new or completely outdated, Green Planet Electric will always work with you in mind to complete your project to your full satisfaction. Further, since our establishment more than 40 years ago, our list of satisfied customers are constantly increasing – we look forward to welcoming you soon. WE ARE AN AUTHORIZED CONTRACTOR WITH THE ELECTRICAL SAFETY AUTHORITY!! Having electrical work done? Only licensed electricians are permitted to do wiring in Ontario…if requested – we provide you with a certificate of our work from the authority that is responsible for electrical safety in Ontario. DMN Electric is a fully licensed and insured, non-union electrical contractor company operating in Toronto GTA area. When it comes to residential or commercial electric services, make sure you trust the best! Here at Fredrock Electric, Inc., we know electricity! Fredrock Electric, Inc. is locally owned and operated by master electrician Dan Frederick who has worked for more than 30 years in the electric field. You will not find a more passionate person whose goal is to provide quality electrical services and excellent customer service. 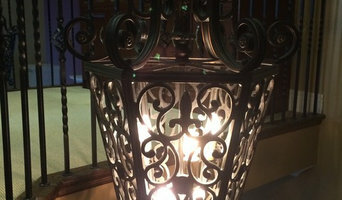 The Fredrock Electric, Inc. team’s knowledge and versatility are what separates them from other electrical contractors. We are a fully licensed and insured company, offering great service at affordable pricing. After years in the industry, Fredrock Electric, Inc. is only known for reliable and quality work that always passes inspection. Call us today to learn more about our services. Residential Electric We are proud to say we have helped many homeowners throughout the years. Fredrock Electric, Inc. handles everything from repairs and inspections to remodeling and circuit panel upgrades. No matter what your electrical needs are, we can help you! 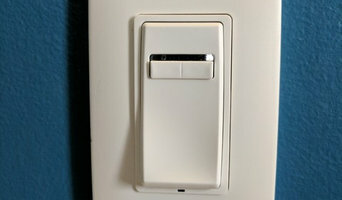 The services we offer our residential customers include the following: Service Box Replacement Service Box Upgrades Repairs and Inspections Upgrade Wiring of Any Type Move Electrical Meters Outside Change Fuses Over to Circuit Breakers Kitchen & Bathroom Wiring for Remodel Wiring for New Additions Pool & Hot Tub Wiring Fire & Smoke Alarm Wiring Security Systems And More! When you’re looking for quality electrical service, look first to Fredrock Electric, Inc. for all your “current” needs! Commercial Electric Fredrock Electric, Inc. is trusted by many business owners to handle a broad range of commercial electrical services. 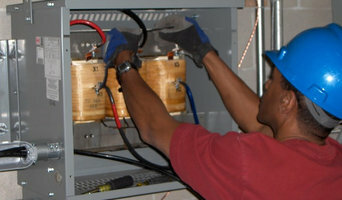 We have been contacted for various types of electrical jobs by contractors and sub-contractors. Some of the commercial services we offer our clients include the following: New Construction Pre-construction Design and Budget General Building Wiring Fluorescent Lighting Ballast Replacement and Updates Temperature Control Wiring Repairs and Inspections Upgrade Wiring of Any Type Fire and Smoke Alarm Wiring Security Systems Data Phone and Cable Wiring Industrial Electric Wiring Give us a call today for your free estimate!